Alex is doing so so so well. He's the brightest, cheeriest little person I've ever been around. This week he had an injury (falling down a stair in his little walker) and his gum was bleeding for a few hours. There's something cutely disconcerting about a little baby smiling and laughing with blood streaming down his mouth. Almost by the time we'd gotten to the ER, his gum had already started to heal, but we went in anyway, panicky new parents that we are. Luckily, the ER at Kaiser isn't one where you have to wait hours and hours (at least not when I've been there). He's now got five teeth: three on top and two on the bottom. 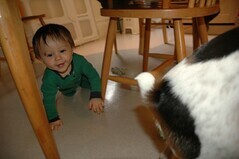 He's crawling like crazy and plays with Teddy (my mom's dog) constantly. He loves to feed Teddy, though he hasn't quite learned that once you put something in the dog's mouth, it's best not to put it back in your own mouth afterward. I love watching Alex throw Teddy the ball. He only rolls it a couple inches, but he seems to be getting the concept of Fetch. Also, today he waved "bye bye" to Mammie during their video chat. We visited my brother on Friday. Alex went in the hot tub for the first time--and that night he slept for 7 hours straight. Then, last night, another 7-hour stretch! I've woken up feeling so refreshed the last two mornings. I think he's only slept that long for two other nights that I can remember. I don't mind getting up with him, as he goes to sleep right after nursing, but sleeping through the night is beautiful and I'm really hoping we'll both do more of it. I broke out in a weird rash today, and all I could think was how glad I was that it wasn't Alex who had the rash. That's a mother's love. Now I need to go give Carrie some feedback on her birthday plans. You should too! I love all the gleeful action of the photo... Alex and Teddy both seem to be tearing around the room with joy. So much action in the house! they're both happy little guys!